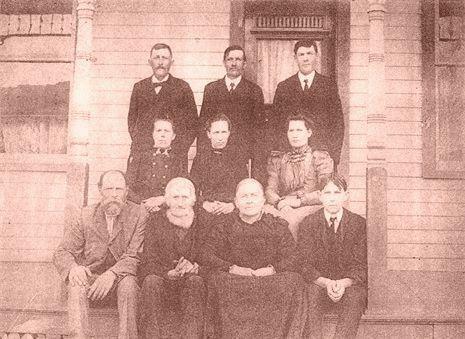 The Terlouw (Pella, Iowa) family. Pella Iowa was founded in 1847 when eight hundred Dutch immigrants led by Dominee (Minister) Hendrik (Henry) P. Scholte settled the area. The name "Pella" is a reference to Pella in the Perea, where the Christians of Jerusalem had found refuge during the Roman Jewish war of 70, the name was selected because the Dominee and the rest were also seeking religious freedom. Pella is located at 41°24′26″N 92°55′2″W41.40722°N 92.91722°W (41.407311, -92.917352). One of the Pella immigrants was Jan Terlouw, born April 22, 1825 in Hoogblokland in the province of South Holland, son of Jan Terlouw and Grietje den Ottelander. Jan arrived in America June 10, 1855. Jan Terlouw married Christina (Stientje) Korver May 17, 1859. Stientje Korver born March 12, 1843 in Vinkeveen in the provence of Utrecht, daughter of Jan Korver and Marretje van Deijl. Stientje arrived in America June 30, 1856. Jan and Stientje moved on a farm South of Pella. In the middle 1860’s they moved five miles northeast of Pella. Records show that on June 9 they bought 80 acres, for $100.00, the minimum price for overflow land. Later they increased this to 216 acres. In 1880 they moved to Jasper County to a farm in the Bethany area. In the late 1890’s they moved to Pella, Iowa, living on the corner of Washington and West First, the present site of the Open Bible Church. Jan and Stientje had 14 children. Six died as infants. Front, L-R: John (Jr.), Father (Jan), Mother (Stientje), William. Middle, L-R: Martha, Johanna, Wouzina. Back, L-R: Gerrit, Henry, Nicholas. John (Jr.) married Annigje Kool / Martha married Henry Mathes / Gerrit married Jan Elscott / Henry married Kate de Heer / Johana married Jacob van Gorp / Nickolas married Ida van Houweling / Wouzina married Peter G. van Gorp / William married Doris Cousineau. All lived in the Pella, Sully and Kilduff area, except William who moved to Minneapolis, Minnesota. Life in those days were filled with many hardships. Houses were far from comfortable, no running water, kerosene oil lamps for light and communication was by word or mouth. Doctors were miles away and could only be summoned personally. Perhaps this was one of the reasons for the high rate of infant mortality. The Terlouw family experienced the death of six young children. Two buried in T’Lam Cemetery south of Pella and others in the Dairy Grove Cemetery near Sully. The one sustaining force that made it possible to meet the realities of living within the circumstances was their fait in God, whom they served and trusted. They were devout Christians! They retired in Pella in the 1890’s. Jan Terlouw died December 27, 1908 at the age of 83 years, his wife Stientje died February 20, 1921 at the age of 78. Botn are buried at Dairy Grove Cemetery near Sully. The book "Jan (John) and Stientje (Christina) (Korver) Ter Louw (Terlouw) Family History from 1825 to 1989" compiled by Jeanette De Bruin, Martha Hoksbergen and Alice Ver Meer describes the descendants of Jan Terlouw and Stientje Korver. This book is in my possession and with the information from this book I am able to create a family tree for the most of Jan and Stientjes offspring. Please contact me for further information by pushing on the “Contact” link on top of this page or by clicking here.